Where are unit tests stored? Does ApexSQL Unit Test integrate with SSMS? 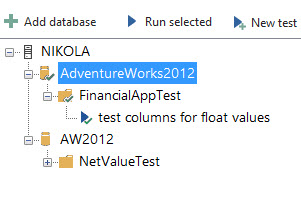 Yes, ApexSQL Unit Test integrates with SSMS 2012 and later. What value does ApexSQL Unit Test offer on top of tSQLt? 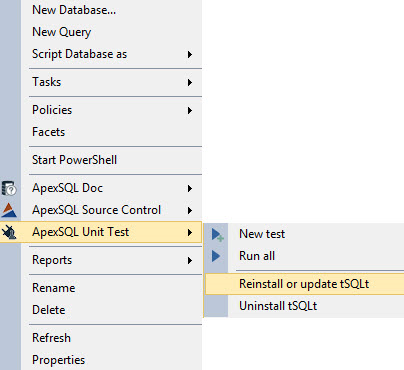 ApexSQL Unit Test utilizes the tSQLt framework and provides a UI in SSMS to make it easier to manage your unit tests. It also provides a set of static analysis tests, also known as SQL Cop tests, to help detect issues with your database, and it shows result of tests (total number of tests, number of executed, passed and failed tests). Are there sample tests to get started with? Yes, ApexSQL Unit Test offers set of database unit tests using SQL Cop and a sample database with some predefined tests. ApexSQL Unit Test supports SQL Server 2005, SSMS 2012, Windows Server 2008/Windows Vista, to their latest versions, .NET 4.5 framework must be installed. Is there a possibility to re-install tsqlt from web if it is already installed from PC? How does ApexSQL Unit Test execute tests? 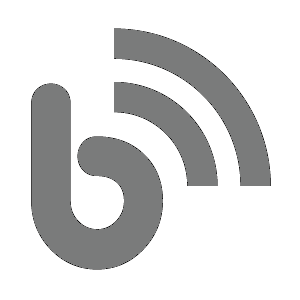 ApexSQL Unit Test execute tests as stored procedures. Possible results are “Fail” and” Pass”. 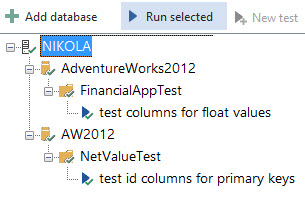 How do I see the list of tests that are already in the database? How can I run all test from server or database? Can ApexSQL Unit Test be automated? Yes, ApexSQL Unit Test can be automated using the CLI.